George Orwell is the pen name used by Eric Arthur Blair. Do NOT combine this page with "Orwell". There are other authors who share that surname. Thank you. The next meeting will occur on Friday, March 27th. We will be taking a look at two fiction novels: George Orwell’s classic novel Down and Out in Paris and London, loosely based on his time as a struggling writer encountering his first contact with poverty; and Philippa Gregory’s The White Queen, a historical tale of marriage and mystery in London. The POLITICALLY INSPIRED BOOK CLUB will discuss Animal Farm by George Orwell. The books will be Dr. Jekyll and Mr. Hyde by Robert Louis Stevenson and Animal Farm by George Orwell. Launch Party for Mike Freedman's School Board! Mike Freedman Reads from "School Board"
Join us to hear Mike Freedman read from School Board! This debut novel features high school senior Tucker “Catfish” Davis who embarks on a quixotic attempt to be elected to the local school board. Armed with idealism and an ever-present fedora, he enlists his school buddies, an indicted Louisiana governor, and a gay journalist with political ambitions to join him in opposing a candidate backed by an Enron-esque oil services company. Based on an actual 1999 news story, School Board is an entertaining but satirical debut novel that revels in the diversity, madness and absurdities of the Bayou City. The WORLD AFFAIRS COUNCIL BOOK CLUB will discuss 1984 by George Orwell. 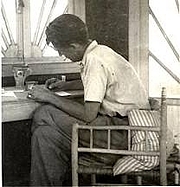 George Orwell was the pen name of Eric Blair, the English journalist and writer noted for his wit and his deep commitment to social justice. His influential novels Nineteen Eighty-Four (1949) and Animal Farm (1945) are among the best-known of his acclaimed works on politics, literature, language and culture. In 2008, The Times of London ranked George Orwell second on a list of "The 50 Greatest British Writers since 1945." George Orwell has a Legacy Library. Legacy libraries are the personal libraries of famous readers, entered by LibraryThing members from the Legacy Libraries group. » George Orwell's legacy profile. George Orwell is currently considered a "single author." If one or more works are by a distinct, homonymous authors, go ahead and split the author. George Orwell is composed of 33 names. You can examine and separate out names.